In December 2016, WhatsApp was updated to version 2.16.17. In this build, the company started encrypting its stand-alone backups stored in iCloud Drive, instantly rendering existing extraction methods ineffective. 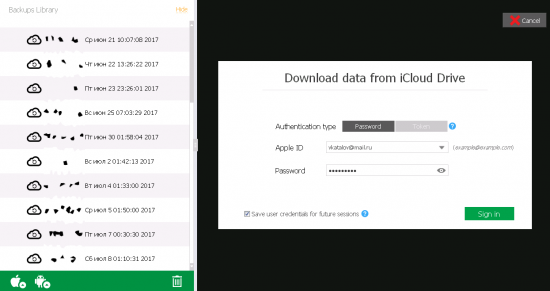 Before the change, Elcomsoft Explorer for WhatsApp could be used to successfully access WhatsApp chat archives by logging in to the user’s iCloud account using their valid authentication credential (a combination of login and password or binary authentication token extracted from the user’s computer). WhatsApp encryption dropped a significant roadblock, effectively preventing this practice and only allowing WhatsApp extraction from iOS system backups (local and iCloud-based). Since last year, both manual and daily stand-alone backups stored by WhatsApp in iCloud Drive are automatically encrypted. 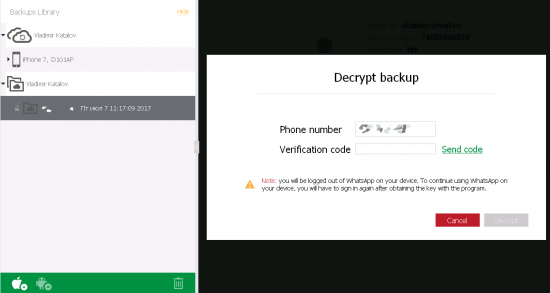 The encryption key, generated by WhatsApp when the user makes a backup for the first time, is unique per each combination of Apple ID and phone number. Different encryption keys are generated for different phone numbers registered on the same Apple ID. 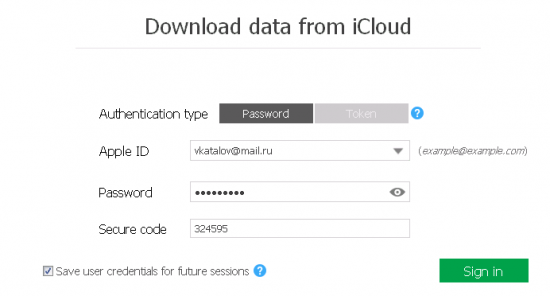 These encryption keys are generated and stored server-side by WhatsApp itself; they are never stored in iCloud, and they cannot be extracted from the device. Elcomsoft Explorer for WhatsApp 2.10 gains the ability to generate encryption keys for WhatsApp’s iCloud backups, successfully bypassing encryption and gaining access to WhatsApp conversation history and underlying messages. In order to generate the encryption key, experts must be able to receive a WhatsApp verification code sent to the phone number for which a given backup was created. In addition, the user’s Apple ID and password (or binary authentication token) are required to gain access to the backup itself. 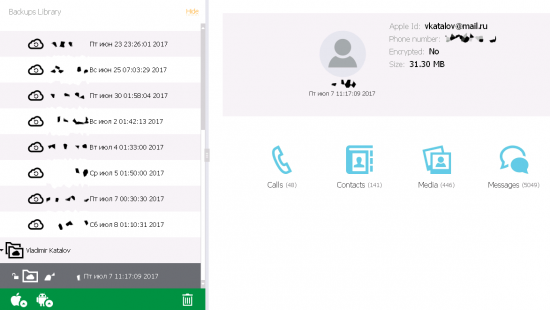 By using the associated phone number and iCloud authentication credentials, Elcomsoft Explorer for WhatsApp initiates the process of registering itself as a new “device” with WhatsApp. After passing the verification process, the tool can request the encryption from WhatsApp and use that key for decrypting the backup. Permanent decryption key: The decryption key received by Elcomsoft Explorer for WhatsApp is permanent and does not change even if the user changes their Apple ID password. The decryption key remains valid even after re-authenticating WhatsApp with the same phone number and Apple ID. The same key can be used to decrypt older backups created before the key was retrieved. Note: since WhatsApp is restricted to only running on a single device, the user’s iPhone will no longer be able to send or receive WhatsApp messages after transferring WhatsApp registration to Elcomsoft Explorer for WhatsApp unless the user re-registers it again. Elcomsoft Explorer for WhatsApp employs a smart workaround for processing WhatsApp extraction from iCloud. This is how it works. In order to generate an encryption key, do the following. Click on the green iOS icon again. Select “Download files from iCloud Drive” from the menu. Note: you will not have to repeat the authentication process as Elcomsoft Explorer for WhatsApp will use cached credentials from the previous steps. Once the download completes, you will see a message that warns that the data is encrypted. You can use the Decrypt option to instantly decrypt data. Alternatively, you may click Open to have data loaded into the viewer. At this time, you can only access media files; text conversations are still encrypted. If you attempt to access encrypted data, you will be prompted for a code. Click Send to request a code. The code will be delivered to the phone number. Enter the code into the “Verification code” box. Once the correct code is entered, the data is instantly decrypted. If you have other encrypted data, click on the lock sign to instantly decrypt. Newly downloaded data will be decrypted automatically. Until last week, WhatsApp users could only exchange pictures, videos and PDF files. The recent update removed that limitation, now allowing users exchanging all types of files. 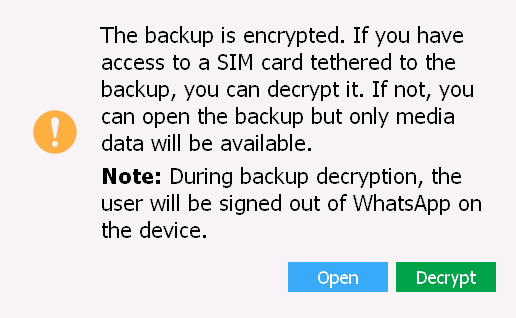 Interestingly, WhatsApp does not encrypt attachments once they are received and backed up. 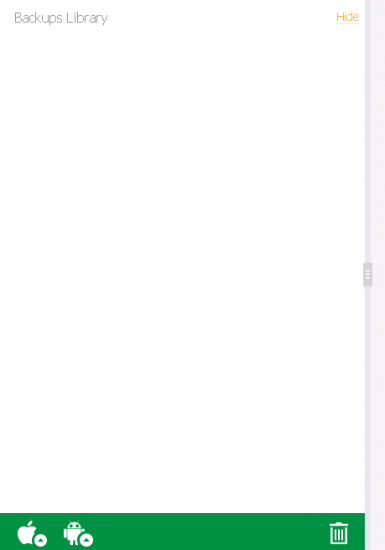 Once Elcomsoft Explorer for WhatsApp obtains a backup, it also receives all attachments. Unlike messages, attachments are stored unencrypted, and can be accessed even if you don’t have access to the registered phone number. In the path above, “N” represents the EXWA-assigned backup number, while “xxxxxx” would be the registered phone number. At this time, WhatsApp acquisition is possible via a number of different methods. Note: WhatsApp only encrypts text messages and calls. Media files (photos, videos, attachments and voice messages) are never encrypted. Despite the discovered workaround allowing experts to decrypt WhatsApp conversations, WhatsApp remains one of the most reliable instant messaging services. Based on Whisper Systems communication protocols, its traffic cannot be decrypted even if someone manages to intercept it. Cloud backups remain one of the few vectors of attack allowing to remotely access WhatsApp communication history. 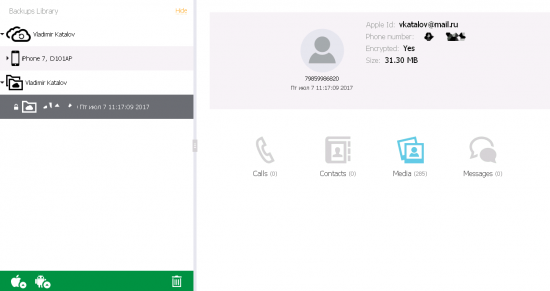 If you have cloud backups enabled in WhatsApp and your iPhone is suddenly de-registered from your WhatsApp account, watch out as someone could have accessed your data. As always, we recommend activating two-factor authentication to protect your Apple ID. This entry was posted on Thursday, July 20th, 2017 at 10:56 am	and is filed under Did you know that...?, Elcom-News, Tips & Tricks. You can follow any responses to this entry through the RSS 2.0 feed. Both comments and pings are currently closed. Two-factor authentification again… Please do something for that. There probably isn’t a way. We all want that and I’m guessing no one wants a solution more than the guys at elcomsoft. Some thing can’t be done though. December 2017? Do you live in the feature? Thanks, fixed (we meant December 2016, of course).